The Northeast Division is viewed as a division filled with fierce and natural rivalries. Boston-Montreal, Montreal-Toronto, Toronto-Ottawa and Buffalo-Boston quickly come to mind. This summer, most of these teams have been very quiet on the free agency market as well as trade-wise. The only team that made a major move is the Buffalo Sabres that shipped talented pivot Derek Roy to the Dallas Stars in exchange for über-pest Steve Ott and depth defensemen Adam Pardy. Still none of these teams have a marquee player such as Steven Stamkos, Sidney Crosby or Jonathan Quick. Instead, this division is filled with very talented, yet not flashy, players who will provide you consistent offensive numbers year in and year out. Other than the Boston Bruins, none of these teams are guaranteed to make the playoffs, yet each of them will battle to the end for a playoff berth. The Northeast offers plenty of fantasy hockey options to consider in the later rounds of the draft, which is why you have to know when it’s the right time to pick these players, especially at forward where there are plenty of quality players in the 60-70 point range. Again let’s start with the forwards and see who are the offensive players to watch in the Northeast. As always, crunching numbers is an art that hard to master. In this division, we all know that Phil Kessel and Jason Spezza will be top scorers. Kessel finally broke out offensively in Toronto with 82 points after a steady increase in his offensive production. In 2009-10, he scored 55 points in 70 games and in 2010-11, he recorded 64 points in 82 points. It’s fair to say that Kessel is a point player from now on. As for Spezza he rebounded with the surprising Senators with a 84-point campaign in 2011-12 after two consecutive 57-point seasons. After this duo comes a trio of young talented wingers on the rise. 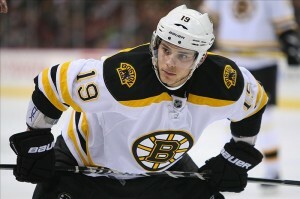 Tyler Seguin is finally living up to the hype and exploded with 67 points in his sophomore year. We can expect a similar point production from the talented right winger, his big breakout coming out in 2013-14 in his fourth year in the league. Max Pacioretty, who’s coming out of his magical fourth year, has finally found his niche on the Habs’s first line, clicking with linemates David Desharnais and Erik Cole. 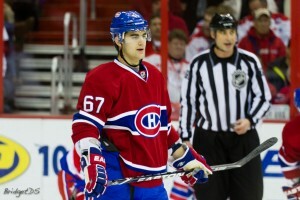 Max Pax recorded 65 points in 79 games for Montreal, after scoring only 49 points in his first 123 games in the NHL. As for Brad Marchand, who has just been re-signed by the Bruins to a four-year contract worth $18 million, he is entering his fourth year in the league. The super pest is ready to break out offensively after recording 41 points and 55 points in the past two campaigns. The duo of Jason Pominville and Thomas Vanek in Buffalo is usually good for 60-70 points most years, but with the lack of a true number one center at the moment, draft them cautiously. A typical Band-Aid boy, Joffrey Lupul would rank higher in this list he was able to stay healthy for a full season, thing he has not been able to do during his career. Expect around 65 games from Lupul as he always manages to find his way to the infirmary. Finally, dynamic puck distributors such as David Desharnais and David Krejci were able to make the list thanks to a great hockey sense and quality linemates. Other notable forwards who barely missed this list include: Milan Lucic, Rich Peverley, Tomas Plekanec, Erik Cole, Milan Michalek, James Van Riemsdyk and Mikhail Grabovksi. When looking at defensemen, it does seem the Northeast has its fair share of talented blue-liners. Defensemen can make or break your hockey draft if you choose wisely. You need at least two steady veterans on your squad along with a couple of youngsters who can provide you with a lot of upside. Most of the Northeast teams have a least two or three puck-moving defensemen capable of producing at a regular pace. Strangely, the powerhouse Bruins mostly rely on Zdeno Chara on the offensive side of the puck, which is one of the main reasons their power-play has been anaemic in recent years. What is going to happen in the Northeast as far as the defensive corps? Let’s find out with this top ten. Again we go on the same basic order of numbers as the forwards. Erik Karlsson is the rearguard who stands out the most following his breakout season with the Senators in 2011-12. EK is easily the best offensive defenseman in the league right now, especially since Mike Green has become so fragile after two great offensive seasons. Steady defenders like Zdeno Chara (50 points) and Dion Phaneuf (45 points) are safe picks to consider, while veterans such as Tomas Kaberle and Sergei Gonchar will still provide good offensive numbers despite an evident decline in recent years. The player most likely to break out this season is P.K. Subban of the Montreal Canadiens. The flashy and cocky defenseman has all the tools to explode. A booming slapshot from the blue line, a great vision and excellent skating skills. With the presence of Andrei Markov for a full season (if he can avoid injuries, which I highly doubt, hence his exclusion), will certainly help Subban polish his play in both zones. Another youngster to watch is Jake Gardiner. Gardiner blossomed under new head coach Randy Carlyle and will continue to have plenty of ice-time and success this season. 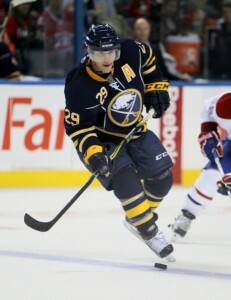 Other options in later rounds include two Buffalo Sabres defensemen in Tyler Myers and Christian Ehrhoff who are both looking to rebound after disappointing seasons. As for John-Michael Liles, he has been fairly inconsistent during his career and with Gardiner’s emergence, he will see his power-play time diminish. Liles has also been a regular client of the infirmary during his career, which makes him an even more risky pick. Other notables defensemen to consider in very deep leagues include Cody Franson, Dennis Seidenberg and Jordan Leopold who will finish around 30 points. Last but never least is the goaltenders. Goaltending in this division is pretty uneven with Boston always having quality goaltending while Toronto doesn’t really have a clear-cut number one to start the season. With Tim Thomas taking a sabbatical year, young and talented netminder Tuukka Rask will finally get his chance at being the starter for the Bruins. After Rask, you will be well served if you end up drafting Price or Miller on draft day, even if they are playing for fringe playoff teams in Montreal and Buffalo, respectively. Here were our top five fantasy goalies from the Northeast Division. Again, these predictions are very much opened to debate, so feel free to comment them. Rask, Price and Miller are all potential #1 goalies to own in fantasy hockey leagues, while Anderson is a solid #2 netminder to own because of his steady numbers and strong hold on the #1 goalie job in Ottawa. As for Scrivens or Reimer, steer clear from them for now as you’re best option is to claim them off the waiver wire when a clear-cut starter is named later this season. * – Indicates the following categories: GP, Wins, Losses, OTL, Shutouts, GAA, save percentage, and Up/Down. ** – Toronto will most likely split time between James Reimer and Ben Scrivens to start the season for the lack of a better option with Scrivens getting the most starts. With a career save percentage of .926 and goals against average of 2.20, Tuukka Rask will be a top 10 overall fantasy option in net for 2012-13. As for Carey Price and Ryan Miller, they will get the bulk of the work load in goal with the +$6 million/year salary they will both earn in 2012-13. Please note that should Craig Anderson falter and have a tough start, the Ottawa Senators will not hesitate to utilize Ben Bishop, as the young puck-stopper gained the confidence of the organization with a solid performance after his acquisition from the St. Louis Blues. As for the Toronto Maple Leafs it’s hard to gauge their goaltending other than really to stay away from both James Reimer and Ben Scrivens as they are risky picks at the moment. Leafs GM Brian Burke could also decide to acquire a veteran netminder via trade during the season if he is not happy with his young tandem. If you had to go with a goaltender based on games played, it would have to be Carey Price, who has been a workhorse in his young career, but if it was based on stats, your goalie would likely be Tuukka Rask. That is it for the Northeast Division. Saturday will bring you another division as we cover the 30 NHL teams from a unique standpoint here at The Hockey Writers. From there this fantasy hockey preview will have roundtables and a little of everything so stay tuned as this is only just the beginning. You can also follow me on Twitter for more information on the NHL.